"We are continuing with the rescue operations because we think there are other people alive under the rubble," Genoa police spokesperson Alessandra Bucci told Reuters news agency. "There might be the possibility of some niches being created by the rubble itself, with people being protected by the rubble," he said. "The units that we have sent are the units that we use during earthquakes. So it is the same sort of situation - and also the risk of other collapses, obviously, is the same." An unnamed witness quoted by Italy's Ansa news agency said: "We heard an incredible roar and first we thought it was thunder very close by. "We live about 5km [three miles] from the bridge but we heard a crazy bang... We were very scared... Traffic went completely haywire and the city was paralysed." 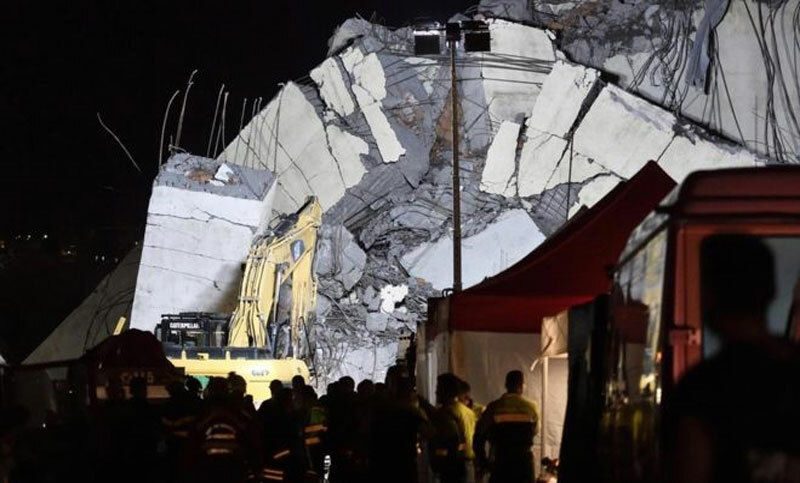 The collapse of the bridge was an "incident of vast proportions on a vital arterial road, not just for Genoa, but for the whole country", said the governor of Liguria region, Giovanni Toti. "The Morandi bridge connects three major ports in our country, used by tens, even hundreds of thousands of people. They depart from these ports on holiday. These docks receive most of our country's imported goods. It damages the very structure of the Italian logistics system. We are expecting a very fast response from the government." Reports say cries can be heard from people trapped in the debris. Twelve people are said to be missing.